Back in 2014, I welcomed in the New Year with an internationally recognized sparkling wine made in Nova Scotia from one of my favourite wineries to visit. It’s a must visit, must buy, stop every time I go to Nova Scotia .This wine has been sold out now for several years but there have been more recent vintages to take its place. 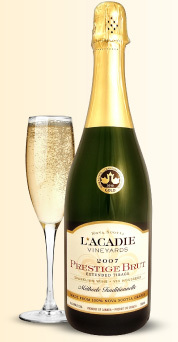 A traditional method sparkling wine from l’Acadie grapes, a hybrid varietal that excels in Nova Scotia. A certified organic vineyard started in 2004 in Gaspereau Valley, Nova Scotia. A veteran winemaker with over 25 years of winemaking experience in California, Australia, Ontario, British Columbia and Nova Scotia. 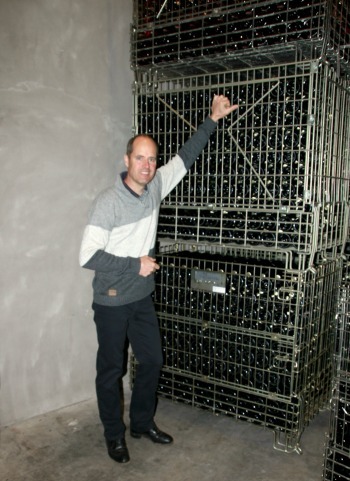 Former head winemaker at BC’s Summer Pyramid specializing in organic sparkling wine. This is the first traditional method sparkling wine that I’d ever enjoyed. On my first wine tour to l’Acadie Vineyard in 2010, I was enough of a rookie to think $40 was a lot to pay for a type of wine that tended to taste of stale bread and Alka Seltzer. Then I took my first sip, to my delight there was this vibrant dance of fine bubbles with undertones of fresh baked dinner rolls and tart ripe apples in my glass and I was hooked. By the time Bruce Ewert had explained to me the process of making traditional method sparklings, complete with its whole vocabulary of bottle fermentation, tirage, riddling, disgorging and dosage, I fully appreciated the price point and bought a bottle. I’ve bought five more since to celebrate a retirement, a milestone birthday, a new house, a new grandchild and of course New’s Years Eve. I now make sure to have a bottle of sparkling wine in cellar, there’s always something worth celebrating on the horizon. Bruce Ewert has generously educated Nova Scotia wine tourists and mentored several local winemakers on the fine art of traditional method wines and so today there are five wineries currently making a wide selection of traditional method sparkling wines in Nova Scotia. (See my blog Welcome in 2014 with NS Bubbly) all of which have received national acclaim. Nova Scotia may sometime in future be the “Champagne” region of Canada, and the credit will be due in part to the vision and trailblazing of this winemaker.I’ve bought and liked a lot of other Canadian sparklings since that visit to L’Acadie Vineyards, but this is the gold standard that I judge them by. Click here to find out where to buy this wine. Sadly, it is almost sold out but Prestige Brut ’08 is now on the market and there are future Prestige Bruts undergoing tirage.